The Los Angeles City Council should be commended for its recent approval of Uber and Lyft pick-ups at LAX. By recognizing these services’ enduring appeal for airport travelers, Los Angeles’ city government now stands at the forefront of municipal ride-hail regulation. And yet, merely adapting to these ride-hail services’ presence will deny the city a crucial opportunity. As Los Angeles officially commits itself to a transport system untethered to the single-family automobile, the city (and the regional transit agency, Metro) should utilize the popularity of ride-hail services to get more people out of their cars and on to public transit. Given that Los Angeles County is geographically-dispersed and that vast tracts of single-family residential zones separate major commercial corridors, the Los Angeles County Metro’s burgeoning rail transit system has faced difficulty accommodating riders who reside or work at a distance from transit stations. Metro’s attempts to solve the “first mile-last mile” gap through parking have largely floundered The free parking at stations like North Hollywood fills to capacity early in the morning on weekdays. Proposals to charge for parking at North Hollywood and similar stations may free up some space but will inevitably turn away a portion of transit riders (particularly the all-day commuters who benefit from the current scenario.) Building more parking, on the other hand, is prohibitively expensive due to a combination of limited building space and exorbitant costs. At the same time, local bus service to a rail station – constricted to major arterials – can be as difficult to access as the station itself and bears the added limitation of a fixed and limited schedule. Finally, “Active Transportation” modes like walking and bicycling, the subject of Metro’s recent First Mile Last Mile Strategic Plan (pages 13 to 14), also tend toward the slower end. Even in the most congested American cities, walking is always slower than driving and bicycling only saves time over driving at rush hour. Active transportation also excludes many transit riders with physical impairments. By offering on-demand service with compact vehicles, ride-hail services are well-positioned to transport passengers from disparate locations to nearby transit stations on a flexible basis. Across Metro’s ten extant or soon-to-be-completed rail and bus rapid transit lines, ride-hail services can potentially offer flexible access to as many as six million people (based on subtracting the figure cited in Metro’s First Mile, Last Mile Strategic Plan, page 1, from the approximate figure of 1.5 million people within a half mile radius of current rail lines, extrapolated from this chart) located within a few miles but beyond immediate walking distance from stations for a cost competitive with the automobile. As a former driver for Lyft myself, I can personally attest that a portion of the population uses ride-hail services in this matter. 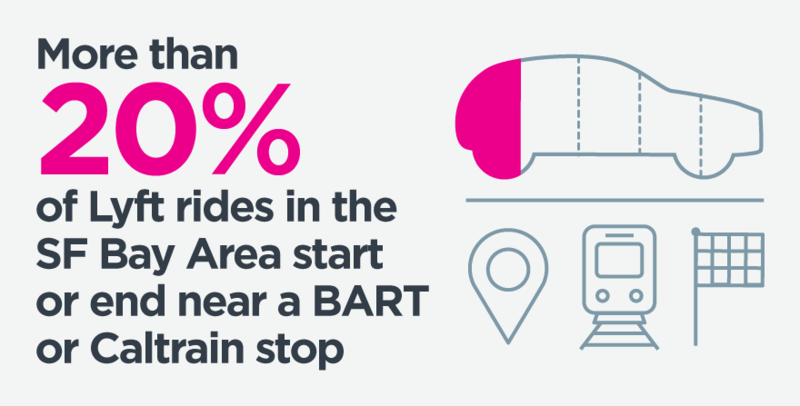 And yet, because most stations have limited loading and parking space and because many drivers are unfamiliar with station layouts, arranging a ride-hail pick-up becomes difficult for those who do not plan carefully. Ride-hail companies can best assist rail transit in Los Angeles if Metro accommodates their presence at stations with infrastructure and information. In terms of physical infrastructure, Metro and city agencies could work together to create “Uberports,” curb space near stations dedicated exclusively for ride-hail pick-ups and drop-offs. The length of such designated curb space would vary based on the station’s level of traffic and availability of parking space. Digitally, Metro (which will bring wireless service to its underground lines within the next two years) could encourage ride-hail company software designers to tailor their apps to detect when a passenger is on a particular rail line and to coordinate pick-ups with a train’s arrival time at a particular station. As for information, public notices on trains could inform passengers of ride-hail services a convenient means for getting home. Conversely ride-hail companies would have the incentive to advertise Metro rail as a low-cost option for traveling long distances with their services. At an advanced degree of integration, Metro might coordinate with ride-hail companies to build public transit fares into the ride-hail operators’ pricing. Los Angeles has already made amazing progress in the construction of subway and light-rail transit. And yet, even with the extensive long-term plans (see page 9) it has on the table, Metro would be a long-way from placing every resident within walking distance of a transit station. Working together to place rail transit within convenient reach of residents who are out of walking distance from a transit station, ride-hail companies and Metro could usher in a true renaissance in Los Angeles’ public transit while placing Los Angeles at the forefront of municipal transit policy. Ryland Lu is a virtual native of Los Angeles, having moved to the city at the age of four. Lu’s enthusiasm for transport extends back to the time he doodled the Los Angeles street grid on his fourth grade classroom assignments. When he is not helping plan for Los Angeles’ multi-modal future as a Student Professional Worker at the Los Angeles City Planning Department, Lu can be found blogging at his website, poring through maps, or traveling the globe. This article expresses the author’s personal opinion only and not that of the City Planning Department or another outside institution. The author notes that driving is faster than walking in all cities. But even though the linked article shows that driving speeds are higher than biking speeds in most cities, it’s still often true that biking creates shorter trip times than driving, because biking often doesn’t involve a search for parking. Of course, ride-hail services save time by not requiring parking at either end, but they still require a wait for the vehicle to show up, which (for short trips) can often leave the bike trip faster. Great editorial. The issue is that cars are super cheap to use, once you have one. They cost $0.10-15 a mile. * It’s hard to entice people away from driving with something costly, as long as they own a car. At ~$10 a day ($5 ride each way), daily ridesharing is too expensive for most – *if* you already have a car. The city requires homes to have parking that adds $200 a month or more to rent – that alone would cover the cost of taking ride-sharing every workday. If people could opt out of that, ditching your car would be a lot more fiscally tenable. But they currently can’t, generally. That said, once people don’t own a car, they’d experiment with substituting cheaper alternatives to ride-sharing, like biking and buses. I think most people, when they stop driving, they start doing more of all of the alternatives; which one depends on their circumstances (budget, location, intoxication, storage needs, fitness, etc). False. Price the parking just high enough to fill the lot. Same ridership, more revenue. Possibly more ridership actually, because some of the people who arrive early will look for cheaper parking nearby instead of parking in the no longer free lot. This seems like Smart Shuttles redux. Those who cannot remember the past are doomed to repeat it. At this stage of the game, providing a designated “kiss and ride” space for ALL short term parkers (10 minutes or less) should be sufficient. And we should not favor (or disfavor) amateur ride hailing services over other ethnic-focused services like Breadcar or the Spanish language-speaking informal TNCs, taxicabs, or regular friend/family/lover pickup and dropoff. I would not want Metro resources wasted on trying to coordinate pricing with all the bureaucratic criteria involved. Good points here. It’s true that once one factors out the cost of leasing or buying a car and depending on the vehicle’s fuel efficiency, it can often be cheaper to use a single-family car than exclusively relying on ride-hail services. But it’s also worth noting that some people (in particular those of the younger age demographic) are moving away from private car ownership. For these folks (myself included, though I don’t quite fall in the “millennial” demo) ride-hailing services as well as hourly and traditional car rentals can be quite cost effective, especially if they are used as supplements (not so much as substitutes) to traditional transit services. As usual, someone once again glosses over the benefits that good bike connectivity creates, especially in this category. This concept can work but we need to drop the “ride-hail” concept. Let there be NO HAILING. Place the taxi/uber/lyft pick-up and drop-off lames right there next to the Metro stations. The cabs can line up in queue and pick folks up who must form a line to hire a car. This will help provide a more organized stream of customers for drivers and commuters have a pick- up point right there at the station. The key to this concept working is having a protected taxi lanes exclusively for the commuters (sort of like protected demarcated bike lanes). Organize the flow with convenience in mind and not have the drivers fight adjoining outside traffic. Not all millennials are alike. Most still live in the suburbs and drive. You can look up the the paper here http://www.uctc.net/research/papers/UCTC-FR-2014-08.pdf. Yes you save some of the time spend on a parking hunt. But you don’t save all that time, because of the need to protect against theft and vandalism. So you have to secure your bike somewhere safe, and remove the parts you consider vulnerable. Many new cyclists never get back on the saddle after their first bike is stolen. They are primarily moving folks living in the densest — and best-connected — parts of the county.